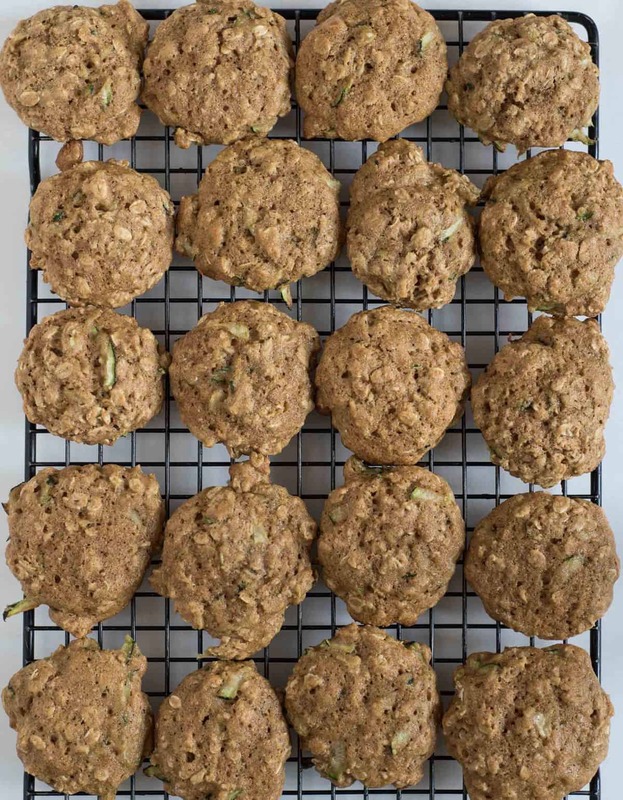 Zucchini Oatmeal Cookies are surprisingly light and fluffy cookies made from oats and shredded zucchini. Do you have plenty of zucchini in your life yet?! I feel like there are so many wonderful things to make out of zucchini that I honestly never get tired of it coming out of my garden. It’s such a simple vegetable that it goes well with everything from sweet to savory and breakfast to dinner. Really, is there anything that zucchini can’t do?! 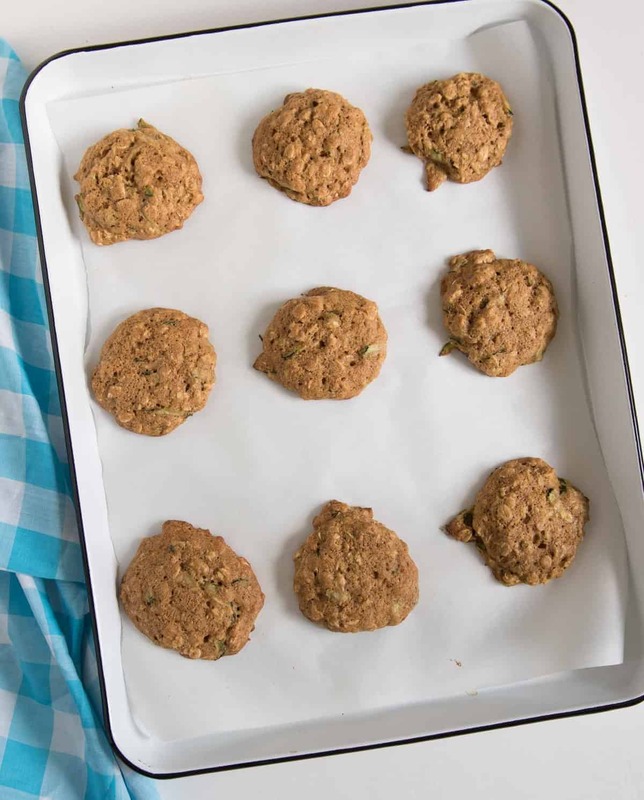 Today I’m sharing one of my all-time favorite sweet zucchini recipes: Zucchini Oatmeal Cookies. I’ve been making this recipe for years and love it because it is a healthy-ish sweet zucchini recipe that is easy to make and easy to share. Now I love me some zucchini bread, but honestly my kids don’t eat it super well and it tends to go bad or I end up eating the whole loaf. 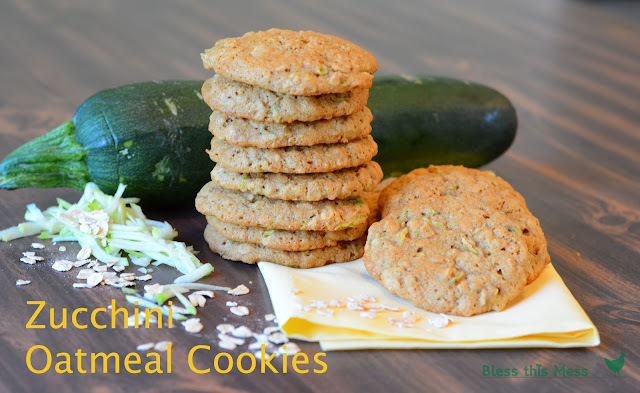 Zucchini in cookies, however, is one of their very favorite treats. 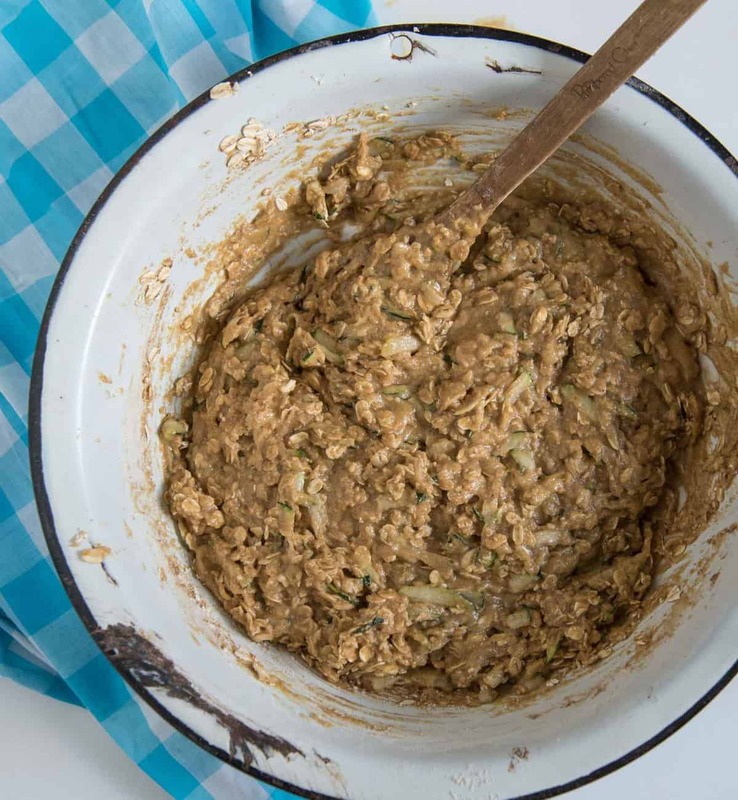 I love this recipe because it can be made with butter, applesauce, or coconut oil (or a mix and match of any of those), it has whole grain wheat flour and oats, and it has vegetables in it. Sure it has some sugar, but all in all, it’s a pretty well-rounded treat with healthy fats and fiber. And the cookies are delicious! The addition of zucchini makes these cookies extra light and puffy – similar in texture to a pumpkin cookie. Feel free to add some chocolate chips to these (though they are great without them). This is a great way to use bigger zucchini that might be a little tough; Peel and remove any seeds from larger zucchinis. Smaller squash don’t need anything done to them. If you are trying to hide the fact that there are veggies in your cookies though, peel the zucchini regardless of the size. If the kids can’t see the green, they don’t even know. 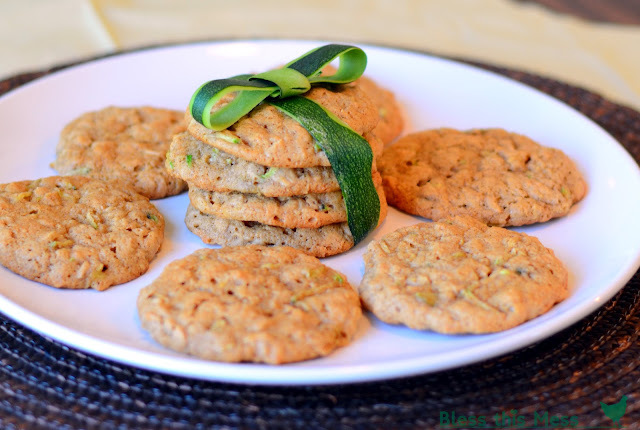 The whole wheat flour lends a great nuttiness to this cookie and helps to absorb some of the extra moisture from the zucchini. I strongly recommend using it. You will probably need 1/3 cup more flour if using white flour. Don’t store the baked cookies stacked on top of each other. They stick terribly. Place a layer of wax or parchment paper in between the layers. The dough is very wet and bakes up to a very soft cookie. Bake the cookies for an extra 3 or 4 minutes if you like a crunchier cookie. The crunchier cookies are excellent dipped in milk. I have subbed unsweetened applesauce for half the butter lots of times with great success; it’s great idea if you are wanting to save a few calories. I have also used coconut oil in place of the butter and it works well, too. Preheat the oven to 350 degrees. In a large bowl, beat the butter and sugars together until light in color and very fluffy – 3 to 5 minutes. Add the vanilla and eggs and beat for another minute. Add the grated zucchini and mix until incorporated. Sprinkle the flour, cinnamon, baking powder, baking soda, and salt over the wet ingredients. Mix everything together on low speed until well combined. Add the oats and mix to combine. Scoop dough into balls using a 1 ounce scoop and place on a baking mat or parchment-lined baking sheet. Bake for 12 to 16 minutes until the center is set and the edges are golden. Let the cookies rest on the cookie sheet for 5 minutes before transferring them to a wire rack. Store covered. Aren’t those fun? These are a staple cookie in our house all summer long, and I can’t wait for you to try them. Headed to the store to buy some ingredients I don’t have then I’m making these!! I have s big zucchini on my counter just waiting to be used. I have tons of zucchini from my garden and I’m always looking for different ways to use them. Thanks for posting this!! P.S. I just read that you went 8.5 months without a kitchen! I don’t know how you did it? I. Would. die. bless your heart! Bet you’re glad that’s done and over with. or at least I hope it’s done and over with for you! what a breath of fresh zucchini air! Made these this morning! really good! I used 3/4 c. canola oil and 1/4 c. applesauce and they turned out pretty soft with a crisper outside and they are really, really good! My three kids and my friend and her two kids all enjoyed for dessert after lunch! Thanks for another way to use zucchini! Ooh, what a unique recipe! Love this! I tried to report the post as an intellectual property theft, but apparently only the content creator can do that. Good luck! Hey! Thanks to you I got a thing filed and FB took down the post! Feeling successful and I have you to thank for it! Wow! 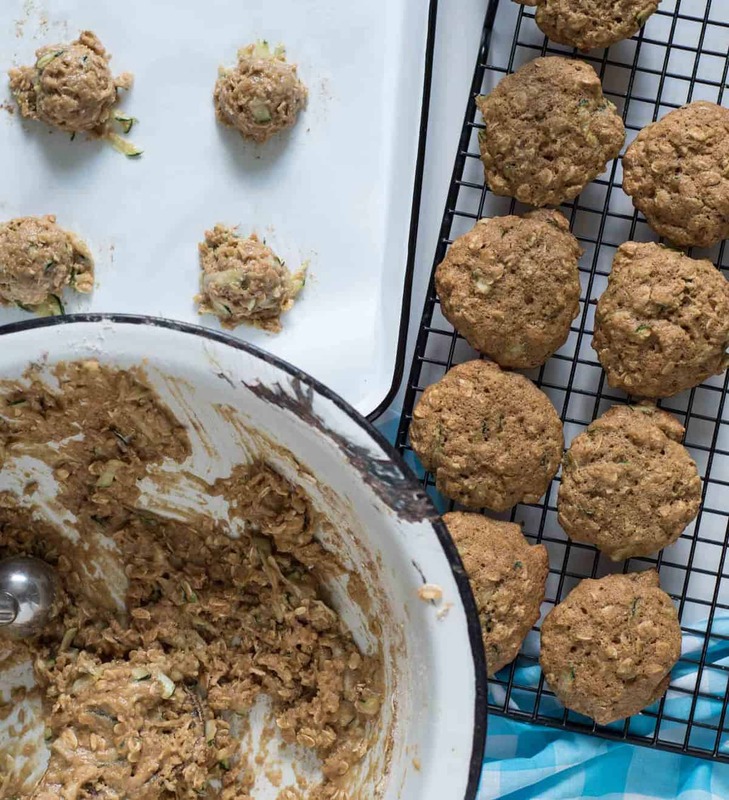 This Zucchini oatmeal cookies looks scrumptious. Thanks for sharing this awesome recipe. These look awesome! I love sneaking veggies into foods my family will eat! These were delicious! I’m going to make these every summer, thanks for the recipe! Our first batch fell flat because we are at 4500’, so I tried again with 1/2c more flour, only 1/2c sugar instead of 2/3, and 1 1/2tsp baking powder and they came out perfect! Thank you for sharing your high altitude cookie baking changes, I’m sure that will be helpful to other folks too! I’m so glad you gave them a second chance!